Who has access to your business’s online profiles and website? Local business owners are busy people, and keeping track of all your business’s online assets can be tough. Facebook pages, Twitter accounts, LinkedIn profiles, paid online directories like Angie’s list…all of them have user names and passwords that you have to remember. And on top of that there’s your website, domain control panel, website hosting control panel, etc. Who keeps track of all of those? Who has access to them? Who has administrative or editorial privileges for them? 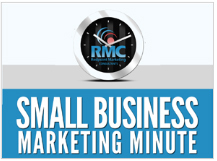 In Episode 168 of my marketing minute podcast, I explain why it is critically important for a business owner to know how to access all of their online profiles and accounts, and also keep track of who else has access to them. I give examples of what can happen when a business does NOT track this information, and explain what situations can sometimes lead to this information not being tracked properly. Use the player below to listen to the episode or browse previous episodes of the podcast.